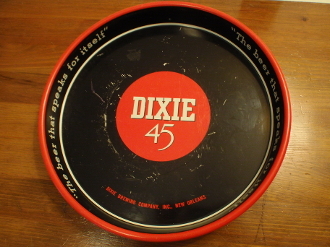 Dixie 45 Beer serving tray with 13" diameter. "The beer that speaks for itself" written on inside rim. Maker marked Dixie Brewing Company, Inc. New Orleans. Tray has some handling marks & wear. Nice tray that will display nicely.